MSAFE are a CDM consultant firm offering construction health and safety support to small and medium sized businesses across Hampshire, Dorset, Somerset, Devon, Sussex and Wiltshire. MSAFE’s construction design management specialists based in Bournemouth support your business needs by providing CDM advice helping you to comply with the latest regulations. The CDM service from MSAFE provides practical help to guide your CDM coordinator through the documentation, systems and regulations needed to gain CHAS accreditation in Somerset, Dorset and Hampshire. MSAFE specialise in CHAS application and SAFE contractor application help supporting contractors to comply with the CDM 2015 regulations. Construction sites can be a dangerous workplace, so it is imperative that businesses have the right construction safety processes and procedures in place. CDM courses with MSAFE educate on the CDM duties for principal designers, and CDM coordinators giving a greater understanding of the roles and responsibilities, changes in regulations and general Health and Safety practices that apply. Appoint MSAFE to act as your CDM advisor and let them support you to ensure your projects comply with the latest regulations. Their CDM services include inspection audits, training and expert advice on procedures, policies and systems. Are you looking for a CDM Coordinator in Bristol, Swansea, Cardiff, Cheltenham or Oxford? MSAFE have now got CDM Coordinators in Bristol, Cardiff, Swansea, Cheltenham & Oxford, as well as Dorset, Hampshire & other Southern Counties. 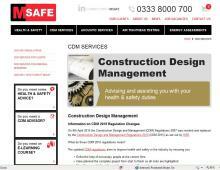 To find out more about MSAFE’s CDM advisory service and Principal Designer services contact MSAFE. Your experienced principal designer for Bristol, Swansea, Cardiff, Cheltenham and Oxford.